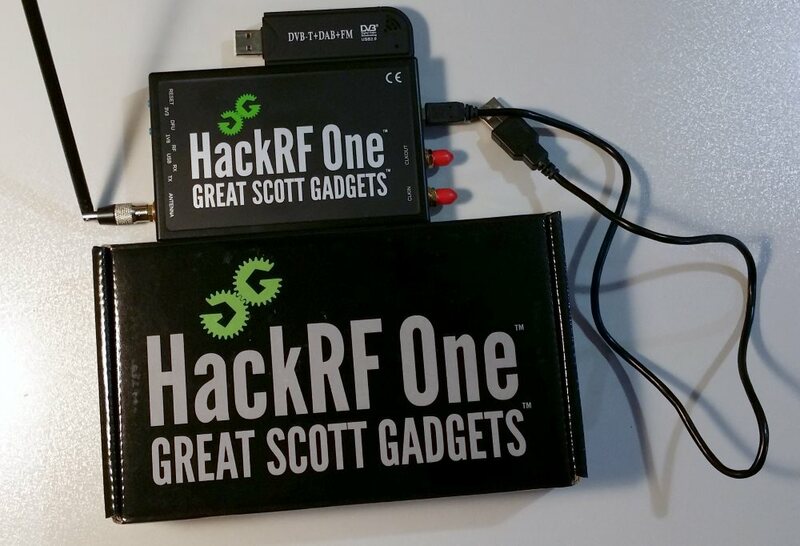 The HackRF One is a new software defined radio that has recently been shipped out to Kickstarter funders. It is a transmit and receive capable SDR with 8-Bit ADC, 10 MHz to 6 GHz operating range and up to 20 MHz of bandwidth. It can now be preordered for $299 USD. We just received ours from backing the Kickstarter and here’s a brief review of the product. We didn’t do any quantitative testing and this is just a first impressions review. 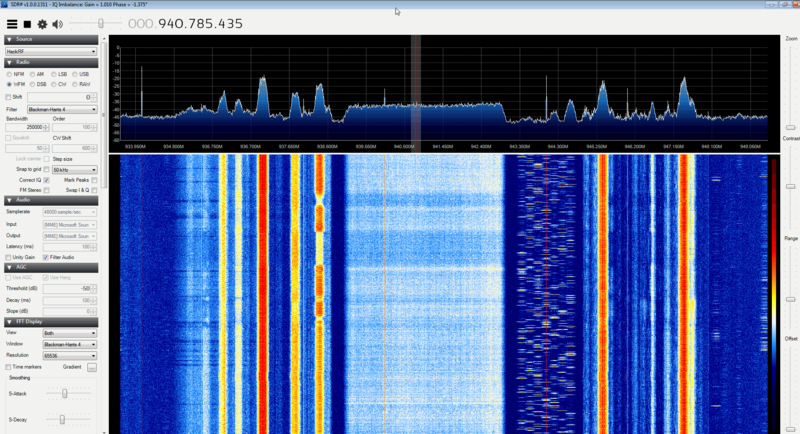 So far we’ve only tested receive on Windows SDR#. Inside the box is the HackRF unit in a quality protective plastic casing, a telescopic antenna and a USB cable. We show an RTL-SDR next to the HackRF for size comparison. 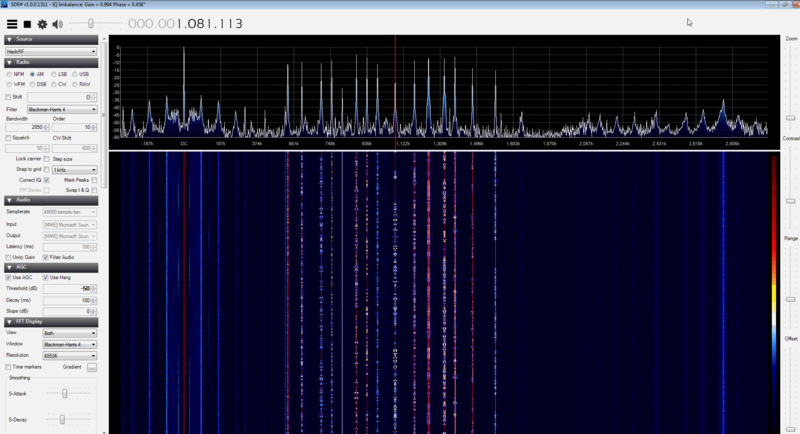 Installation of the HackRF on Windows is very simple and is the same process as installing an RTL-SDR dongle. Assuming you have SDR# downloaded, simply plug in your HackRF into a USB port, open zadig in the SDR# folder, select the HackRF and click install driver. The HackRF is now ready to use with SDR#. 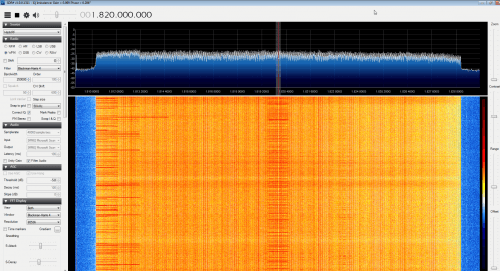 We first tested the HackRF at its maximum bandwidth of 20 MHz in SDR#. Unfortunately at this sample rate the PC we used (Intel i5 750) could not keep up. The waterfall and audio were very choppy, even when the waterfall and spectrum analyser were turned off. After switching to the next lowest bandwidth of 16 MHz everything was fine. With the waterfall resolution set to 65536 the CPU usage was at around 45-50%. It is very nice to have such a wide bandwidth at your disposal. However, the drawback is that with such a wide bandwidth it is very difficult to find a narrowband signal on the waterfall if the frequency is unknown. This might make things difficult for people new to signal browsing. 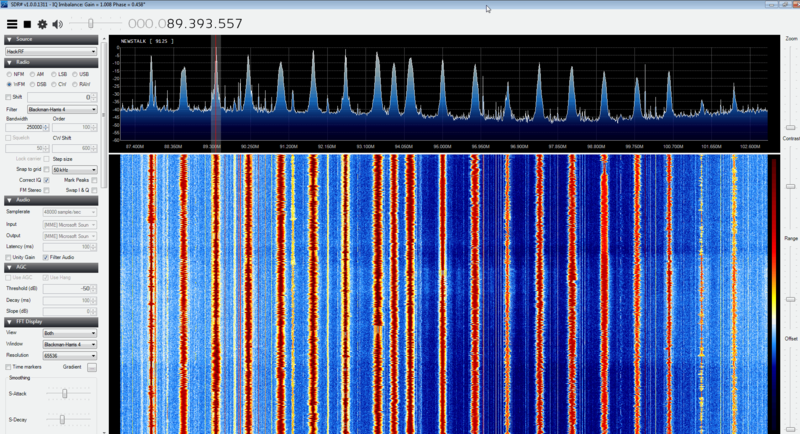 Also, since the bandwidth is so wide the waterfall resolution when zoomed in is very poor making it very difficult to see a clear signal structure, but this is more a problem with SDR# rather than the HackRF. The included antenna is good and made of a high quality build. There is a spring in the base of the antenna which may be an inductor, or may just be there for mechanical reasons. As the antenna screws directly into the HackRF body there is no place for a ground plane which degrades the antennas performance somewhat. The HackRF has no front end filtering (preselectors) so there are many images of strong signals (like pager signals) that show up at multiples of the selected sample rate. 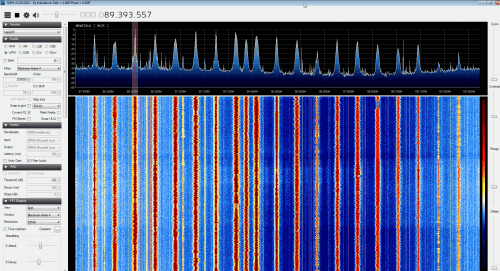 Most wideband SDRs are like this but these images are also not helped by the low 8 bit ADC resolution. Image rejection and sensitivity could be improved by using your own preselector front end like many people have done with the RTL-SDR. Overall reception sensitivity seems to be very similar to the RTL-SDR. A strong interfering spike from the 10 MHz clock can be seen at every multiple of 10. There are three gain settings available for the HackRF in SDR#. One is for the LNA Gain, one for VGA gain and the third is a check box for ‘Amp’. The LNA gain is the main gain that should be used and usually only a small amount of VGA gain is needed as VGA gain seems to just increase the noise the same amount as the signal. We’re not sure what ‘Amp’ is, but it seems to do something similar to ‘RTL AGC’ on the RTL-SDR. The ‘Amp’ button enables a front end amplifier which may be useful for very weak signals, but it should normally be turned off as it also amplifies noise and could potentially damage the HackRF if a very strong signal is nearby (Thanks to ‘Truth’ from the comments for pointing this out). We checked the PPM offset against a known signal and found that the offset was -12 ppm, which was pretty good. Only about 1 ppm of thermal drift was seen throughout the operation of the HackRF. The HackRF was able to receive all the expected signals across the advertised frequency range easily and was even able to go below the advertised 10 MHz to receive broadcast AM. At 10 MHz there was significant imaging from the broadcast AM band however so for HF use you may want to consider a bandstop or other filter. 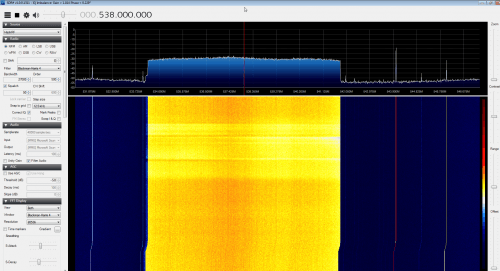 Here are some example wide band signals received with the HackRF. HackRF at 2.4 GHz – Must be WiFi? 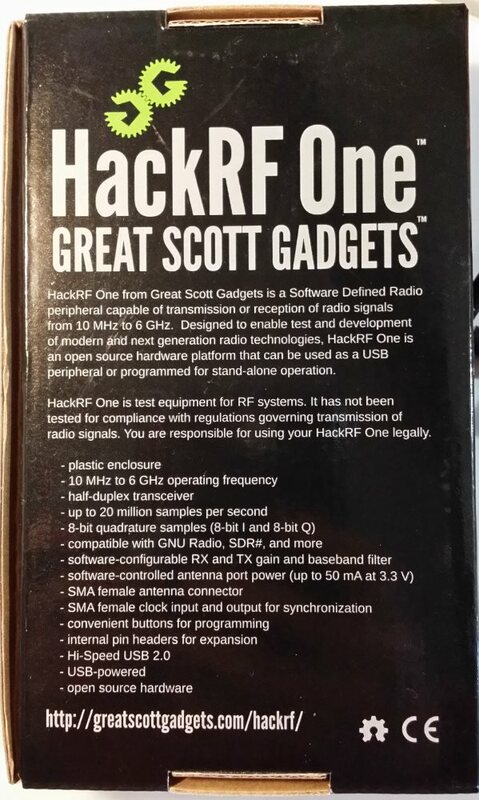 Here is an older review comparing the specs of the HackRF against the BladeRF and USRP B200. So – overall, would this be a good purchase, or should we stick with our upconverters, downconverters and LNAs? I don’t think the guy in the video really understands how these work compared to a soundcard based system like the Flex. Other than to initially pick a HF band you that want to work you really shouldn’t use a 20 Mhz wide ‘window’ to work a band that’s only a few hundred khz wide. If he had lowered the receive window bandwidth to a more reasonable width to fit the band of interest he likely wouldn’t be getting those images. It also illustrates the difference between 8 and 24 bit converters as well as high sample rate versus a much much lower sample rate (192 Khz for the Flex) )That’s why being able to switch sample rates ‘on the fly’ is so important. A more accurate comparison would be lowering the sample rate of the HackRF to be closer to the sample rate of the Flex. It looks like the image for the 2.4 ghz band shows bluetooth data. Wifi is usually at least 20 mhz wide and would cover the whole band. > We’re not sure what ‘Amp’ is, but it seems to do something similar to ‘RTL AGC’ on the RTL-SDR. Leave off at all times and only turn on if the signals are low enough to need the boost is my rule.